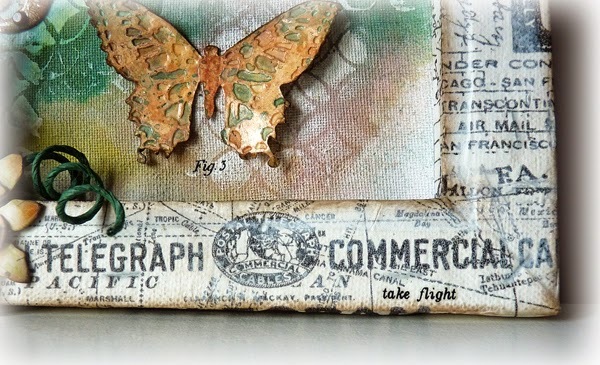 If you haven't caught up with the new Destination Inspiration posts at A Vintage Journey I fully recommend them for ideas, techniques, and of course inspirational projects. 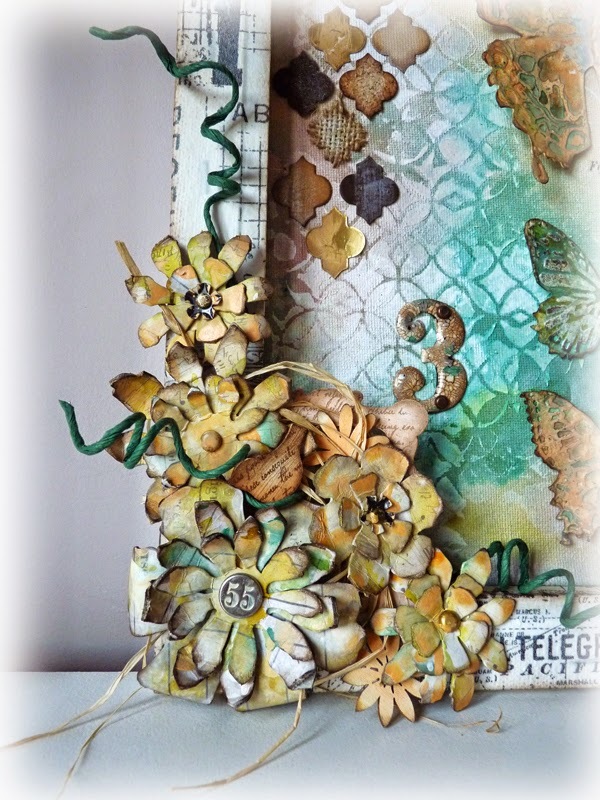 This is a reverse canvas, mixed media style with lots os distress paints iuncluding picket fence and those fabulous grunge paper flowers that Tim shows us how to make in A Compendium of Curiosities 1. 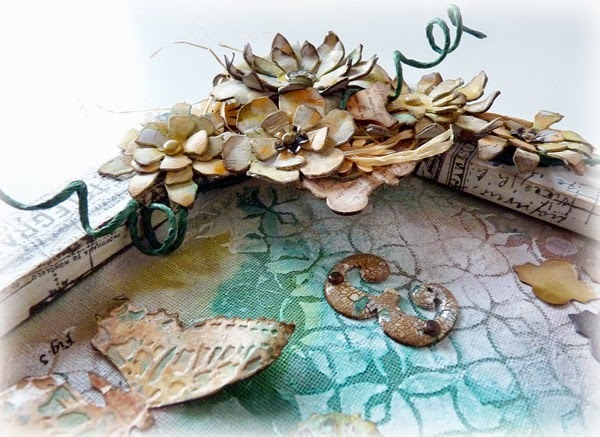 I hope you will pop over to AVJ to see the full details of how I made this project, I would love to see you there. Have a wonderful week and let's hope we some more of that gorgeous sunshine we saw over the weekend. I have chosen to reverse my canvas and work on the back of it as it is more like a shadowbox and I love the depth it creates. My canvas is 25 x 30 cms and I cut a piece of prepared canvas material (to fit in the reverse side) on which to create my background. (I buy canvas pads to do this). 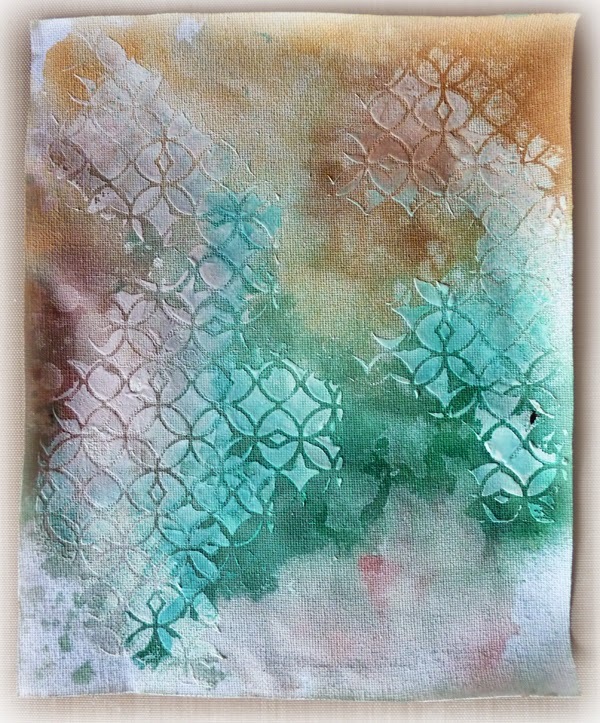 Sand over the surface of the canvas mat with a sanding block to distress the background area. 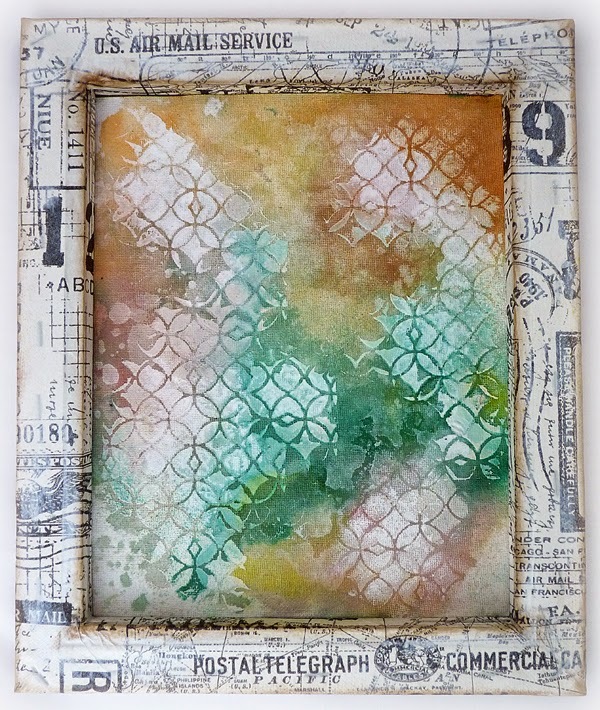 Apply distress paints to your craft mat – dried marigold, victorian velvet & evergreen bough and spritz with water. 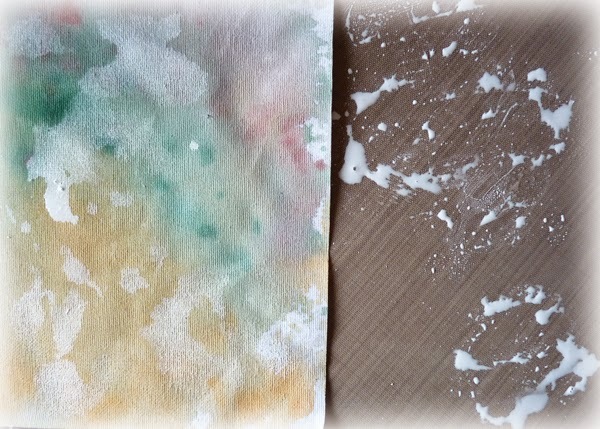 Also spritz your piece of canvas and dip it into the paints to create a marbled effect. Heat dry. 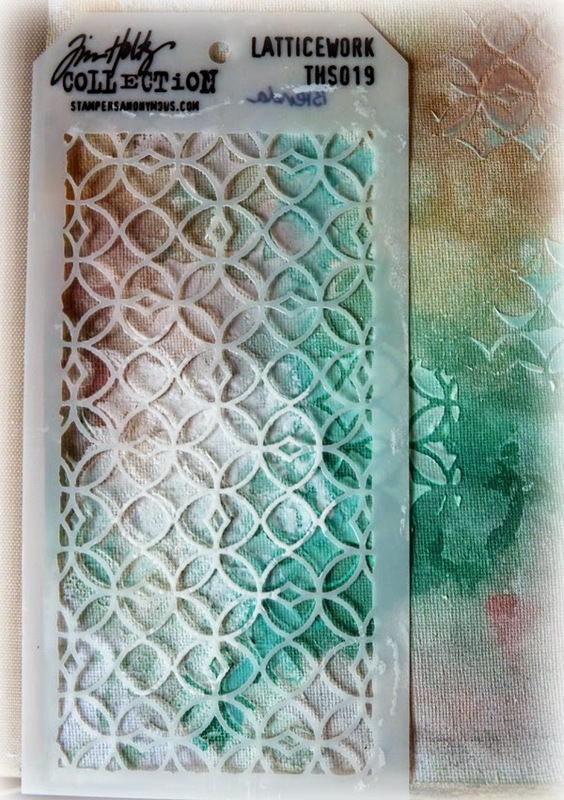 Take picket fence distress paint, apply it to your craft mat and again spritz with water, dip the canvas in to create some mottled patches and dry. Later you will see the lovely mottled effects that are created by starting with a base layer of the paints first. 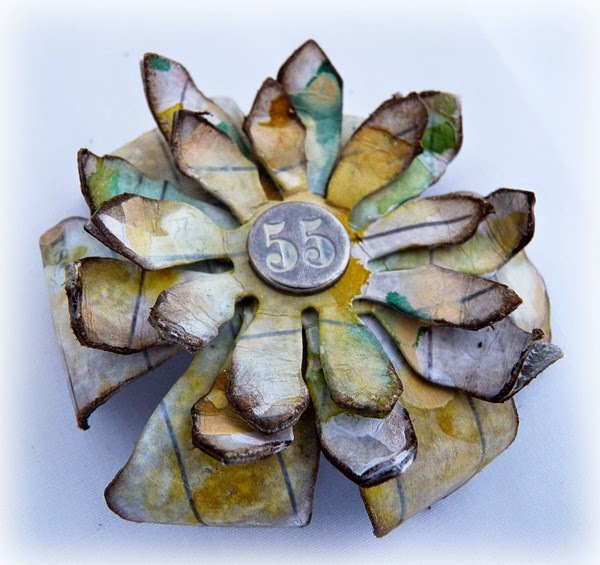 Use light modelling paste and apply through a stencil to create a design. Leave to dry. 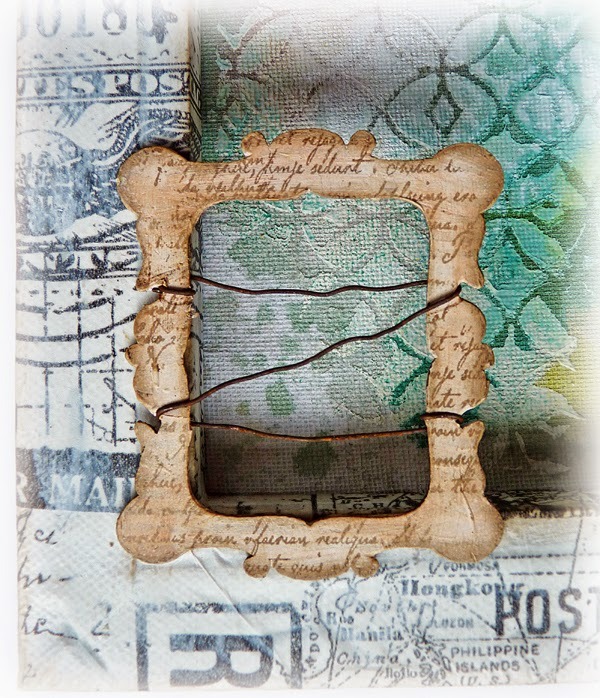 Spritz with distress spays – tea dye, evergreen bough & tattered rose. Heat dry. You can see the mottled white showing through as the picket fence paint has acted as a resist. 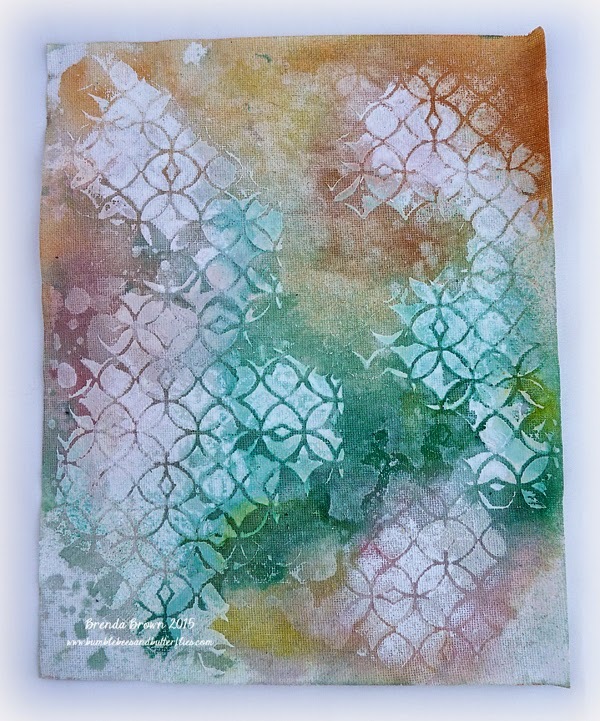 Place the stencil over the design again and dab picket fence distress paint over some of the texture paste pattern to bring it back to pure white again and leaving some with the colour absorbed. 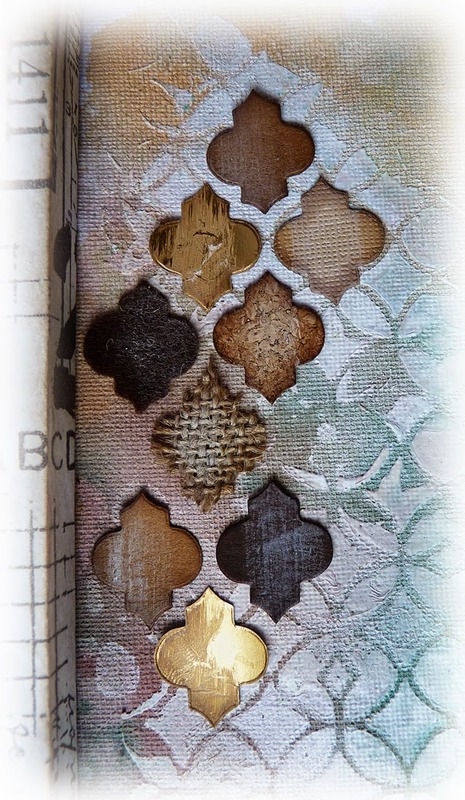 This gives another great mottled effect on the texture. Take the canvas and paint the wood that is showing with white gesso and then cover the edges with Tim’s tissue wrap. 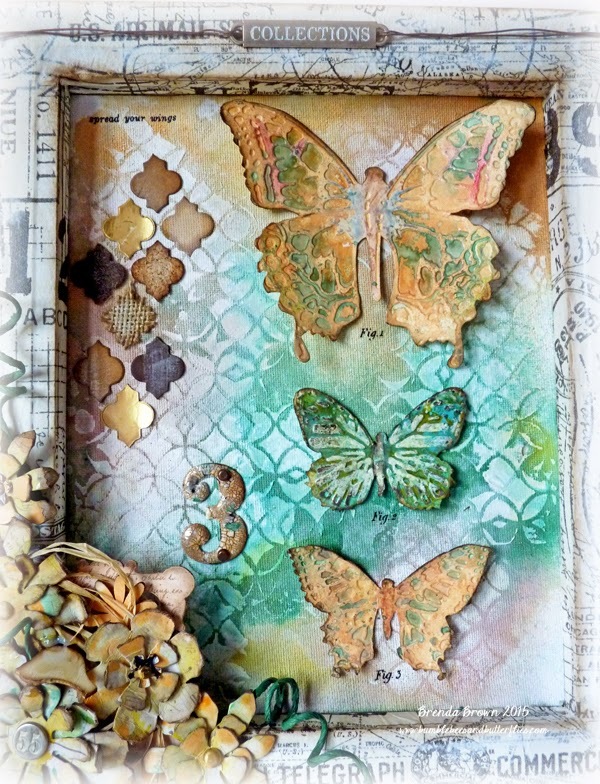 Die-cut and emboss Tim’s layered butterfly. 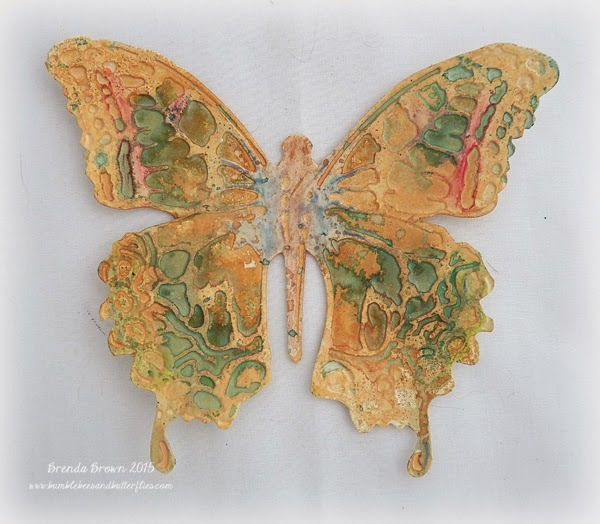 Take your colour of choice from a set of oil pastels and colour all the embossed (raised) parts. (I even got into blending colours using a cotton bud). 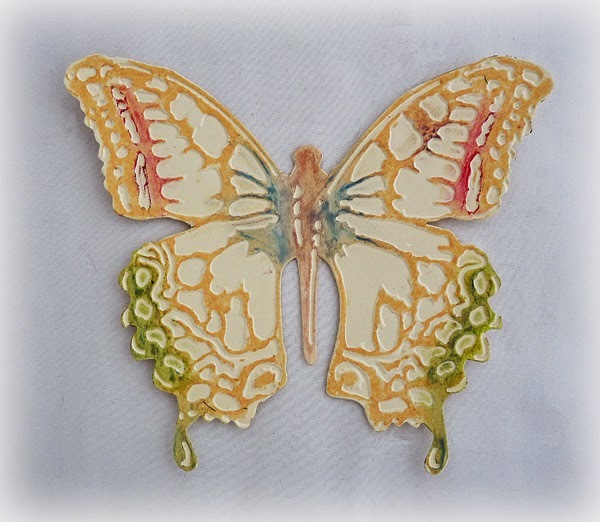 Dip it into a wash of dried marigold distress paint, blot and dry it and then spray with tea dye distress spray. 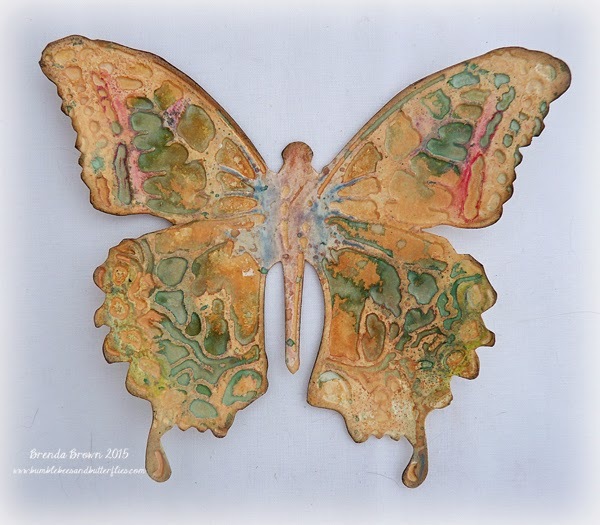 When dry take the evergreen bough and spray a small amount onto your craft mat and spritze it quite heavily with water to get a more watery tone, then dip the wings into it and dry it. Finish by inking the edges lightly with walnut stain and then spraying with a gloss sealer to give the colours more pop and shine. Cut two smaller butterflies from Tim's butterfly duo die and give them the same treatment, strange how the darker one looks so different in style. 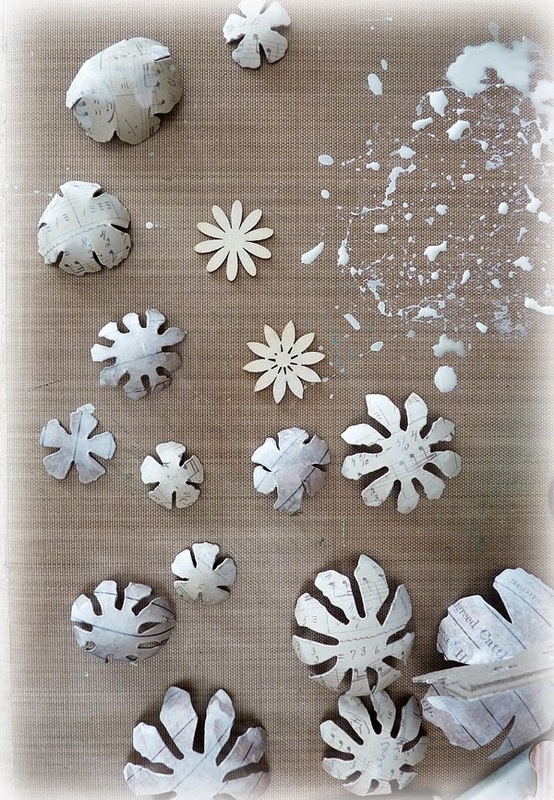 I followed Tim’s instructions on P.65 of the CoC 1 to make the petals and then of course I followed my own route. When you have made up the flowers dip the petals in spritzed picket fence distress paint and dry. To get some colour on them I dipped them in both mustard seed and evergreen bough stains that had been spritzed with water and left them to dry. 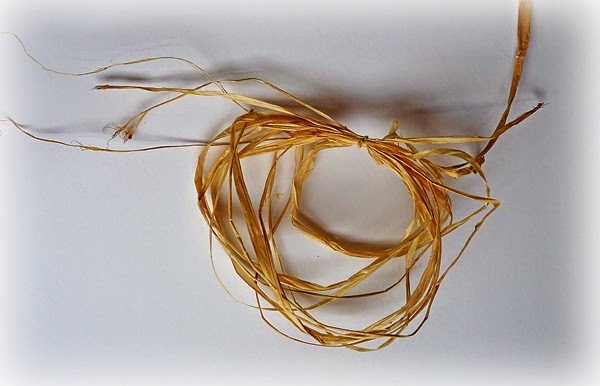 Next I dipped them in dried marigold distress paint – again spritzed with water on my craft mat. Then sand the edges and blend in walnut stain distress ink. 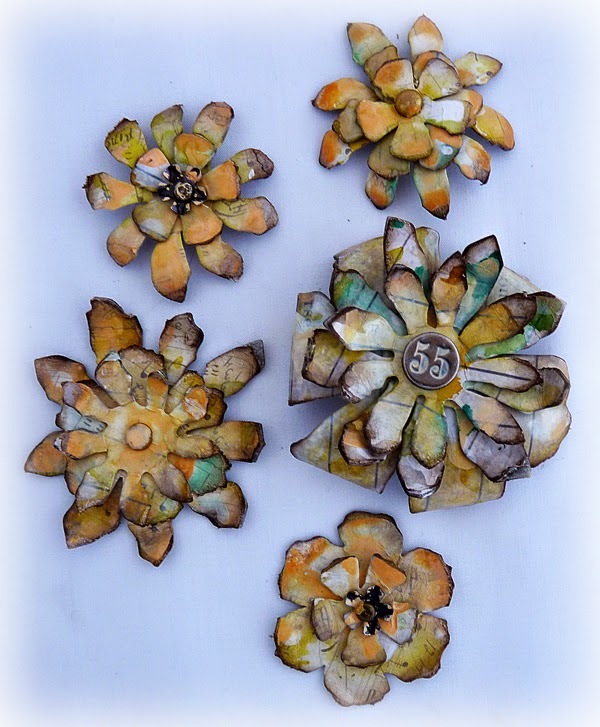 Put the petal layers together with Tim brads or metal flowers with distress paints daubed over them. 18. Dab picket fence distress paint onto a word band and gently wipe the paint off with your fingers leaving the colour to remain in the recessed letters. Dab the edges with potting soil archival ink pad. 19. 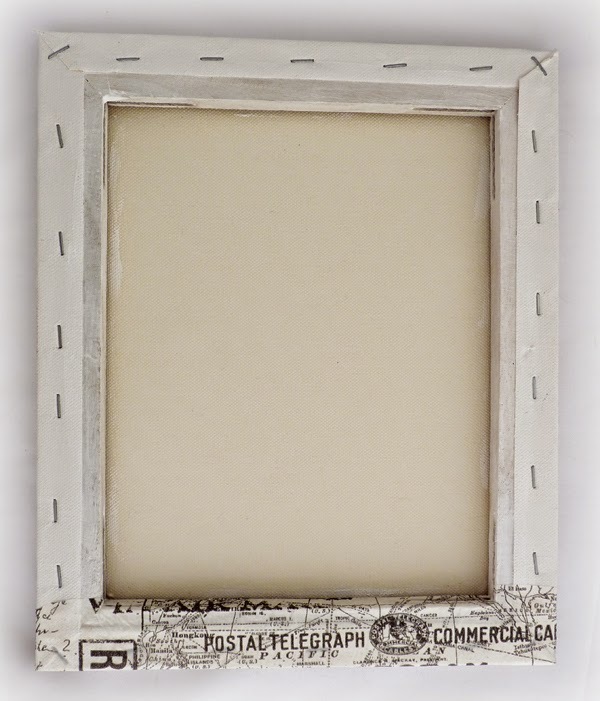 Now start to assemble the canvas – dab picket fence distress paint over the tissue wrapped frame, spritz it and wipe some away from the words and adhere the background into the recess. 20. 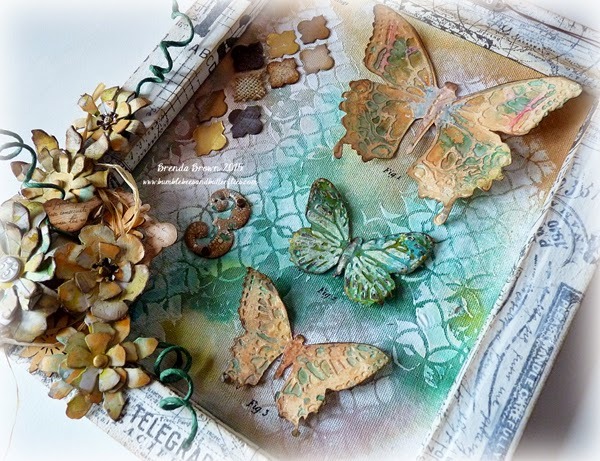 Gather some elements together to create some interest and dimension on the background collage and adhere these to the back. 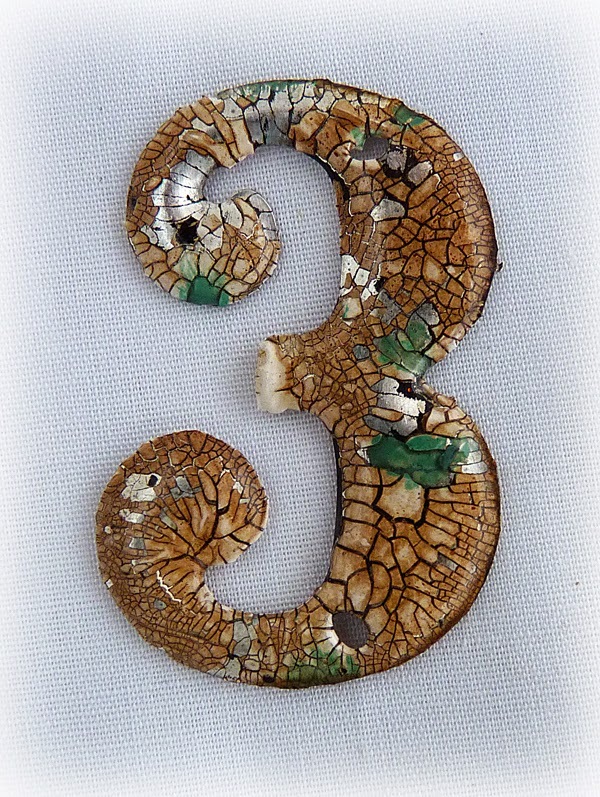 I added some shapes from die-cuts of the trellis frameworks die and I took a metal number 3 painted it with gesso and when dry gave it a thick coat of picket fence distress crackle paint. 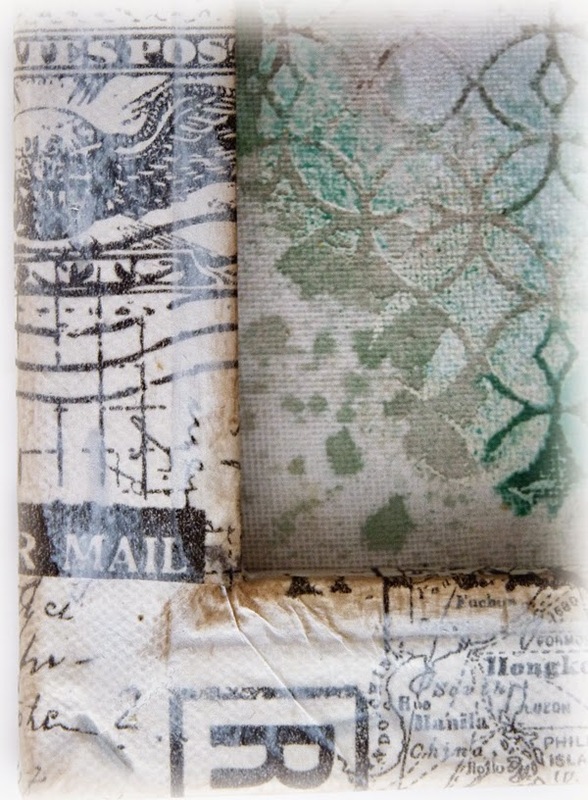 I don't think I made the gesso coat thick enough as the crackle began to flake away but I added some evergreen bough distress paint and then some gathered twigs distress stain, spritzed it with water and dried it off, then gave it two coats of thick clear embossing powder. This has sealed it and will now prevent the crackle paint coming off any more. I rather like the distressed fell to the finish. 21. 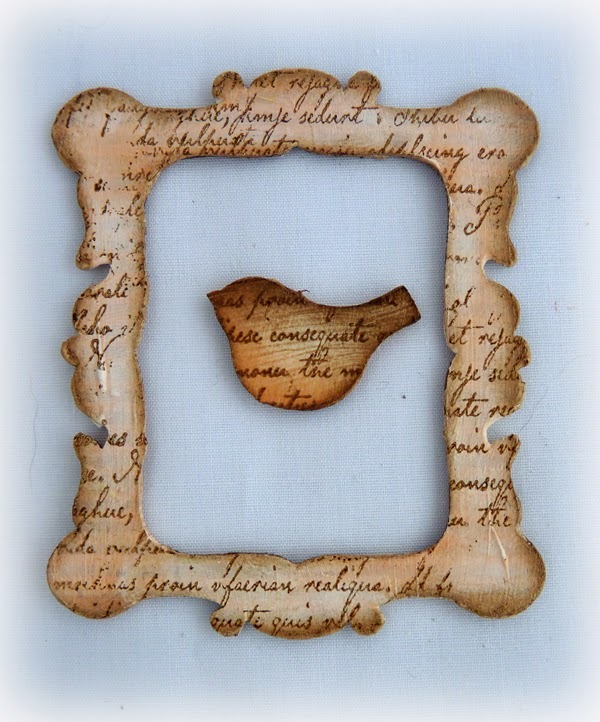 I took a small wooden bird and a chipboard frame from my box, painted them with white gesso and blended tea dye and walnut stain distress ink over them and I also stamped some text onto them. The frame is going to help hold the flowers. (I wired it so the flowers can sit over it easily). .... and some wired paper to the flower collection. .... and the reverse canvas has come together. Look how neat the flowers sit over the corner raised up on the frame I added. .... I hope you have enjoyed seeing my interpretation of the four chosen components coming together. What a beautiful reverse canvas Brenda! Off to AVJ to see how you created it, I am loving these Destination Inspiration posts! Brenda, your reverse canvas is stunning! 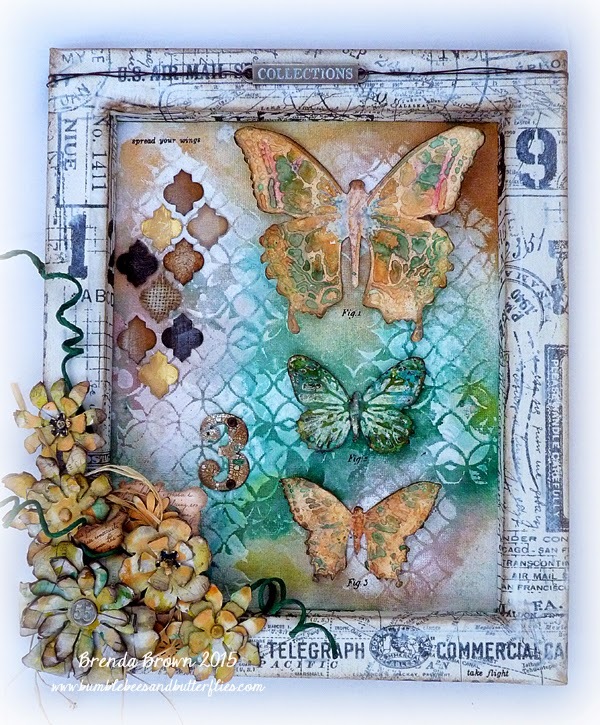 I love your amazing butterflies, fabulous textures and your beautiful grunge flowers! Off to AVJ to see more about this beauty! Oh I love this its gorgeous. I love this canvas, Brenda! It is just beautiful from the butterflies and flowers to the colors and textures. 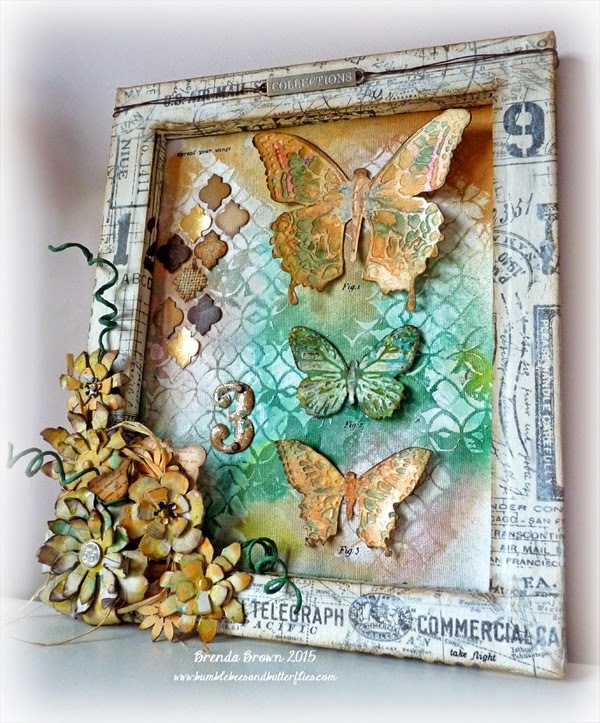 Wow Brenda, this is so stunning...will pop over to AVJ to see how you made it! Brenda, this is just SO lovely! The canvas looks amazing and I am just going to have to get those butterflies! Wonderful DI project! Hugs! A gorgeous project Brenda, will pop over to see it all. A fabulous canvas, Brenda! I love the textures and the grunge flowers. Beautiful composition! EEK! I cannot tell you how much I love this! I love the reverse canvas... LOVE IT!!! 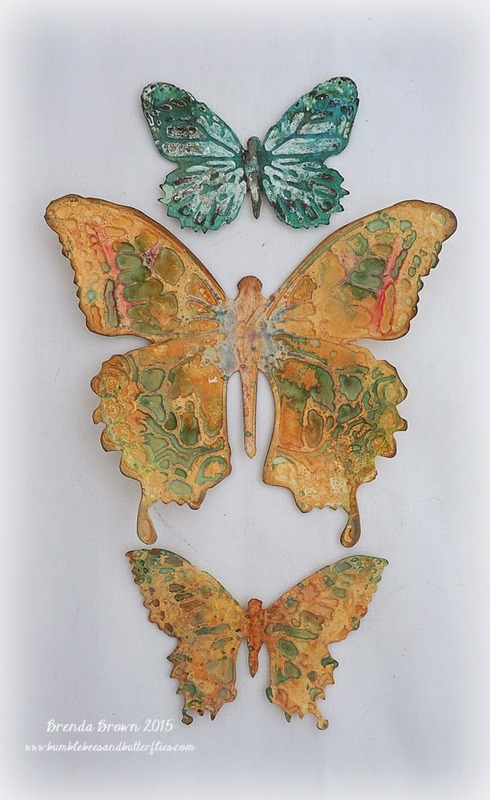 I just bought all these canvas's too and I was looking at my butterfly, dragonfly and bee! I think you just helped me pull it all together! I wasn't feeling the "front" but this works. YAY, I LOVE YOU! I will link back and I've already pinned! PINNED...need I say more?!!! LOVE!! !